An investigation by openDemocracy has made global headlines this week and triggered questions in the UK parliament about 'foreign and possibly Russian interference in western democracies'. "Has she seen the very worrying series of reports this week by openDemocracy, on the role of dark money in the EU referendum, including revelations of illegal donations to the DUP and new questions today over the real wealth of Arron Banks, the main financial backer of Leave? Given the widespread public concern over foreign and particularly Russian interference in Western democracies, will she assure this house that the government and the Electoral Commission will examine these reports very carefully and reassure our country that all of the resources spent in the referendum were from permissible sources?" The story was then quickly picked up by The New York Times, The Guardian, the Financial Times and Bloomberg. 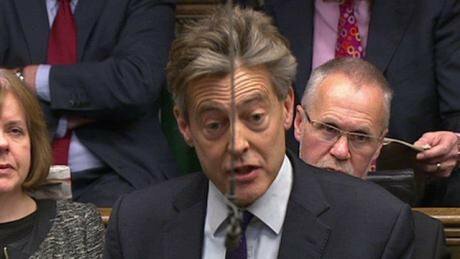 "The series of investigative reports Ben Bradshaw referred to were published by openDemocracy, a political website funded by none other than global George Soros, an expert in 'dark money'." 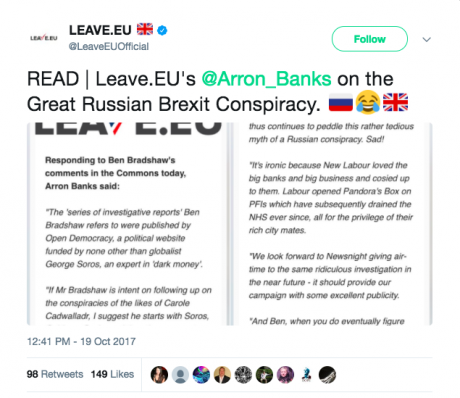 Screenshot from Leave.EU Twitter used under Fair Use. openDemocracy's funding sources are listed here. We invite the same transparency from Mr Banks, and from Northern Ireland's Democratic Unionist party, which is still refusing to reveal the source of all its Brexit cash.